This is a great London broil marinade that is keto friendly. 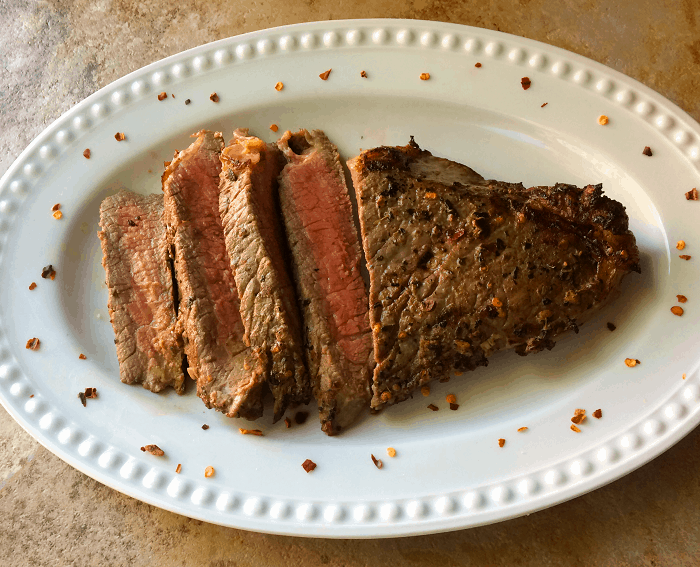 London broil can be a very tough cut of meat, but with this marinade, it tenderizes the meat so that it is just succulent and juicy. One half of the London broil was left in the marinade overnight and the other half for 2 days. We thought the one that was left longer was better, but you can certainly do it for a few hours or overnight. I have also made this marinade and only left it in for a few hours and it tasted it is still really good. 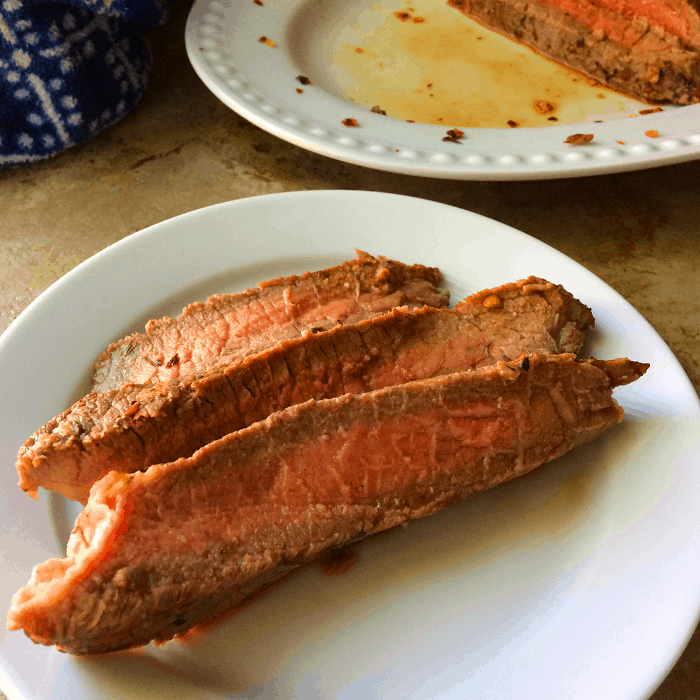 London broil is a fairly inexpensive meat, so it is a great protein to have for family meals. My son and I are the only people in my household that eat meat, so for a 2-3 lbs. cut of London broil I can get several meals out of it for two people. The picture of the whole cut of meat is half of the London broil. I cooked the other half the next night. I hope this will become part of your dinner rotation since it is economical and easy to make. 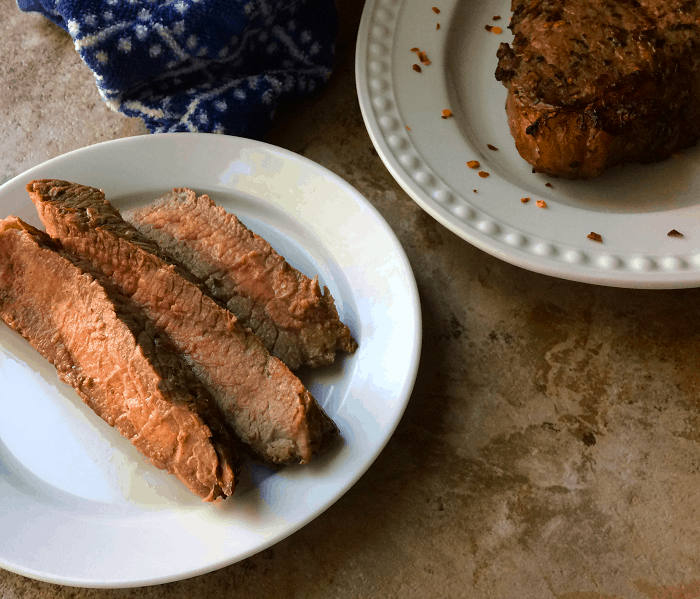 This is a great London broil marinade that is keto friendly that tenderizes the meat so that it is just succulent and juicy. It is delicious and so easy. Add scored and cut London broil to a ziplock bag. Add ingredients to the bag with the meat and rub around until the meat is completely covered. Fold the bag over the meat and try to squeeze out as much air as you can from the bag and seal shut. Place in refrigerator for a few hours to overnight or up to 2 days. Put the oven rack on the highest level closest to the heating element. In a frying pan, sear on both sides. Place the meat on a parchment lined cookie sheet or a broiler pan. Place meat in the oven on the highest rack for a couple minutes per side or until desired doneness. Let rest for 10 minutes after removing it from the oven. Slice the meat thinly with a sharp knife. Enjoy! If your heating element in your oven is on the bottom then you would, of course, reverse the instructions and put the rack on the bottom spot closest to the heating element.